#Bug Fixed in the eMMC Size for over 64GB size. You can resize the eMMC RPMB Partition up-to 8MB different to 1.09 Expanded. You can resize the eMMC BOOT Partition included 3MB , 5MB and 6MB different to 1.09 Expanded. Samsung S.M.A.R.T Report CMD's and sequences implemented. 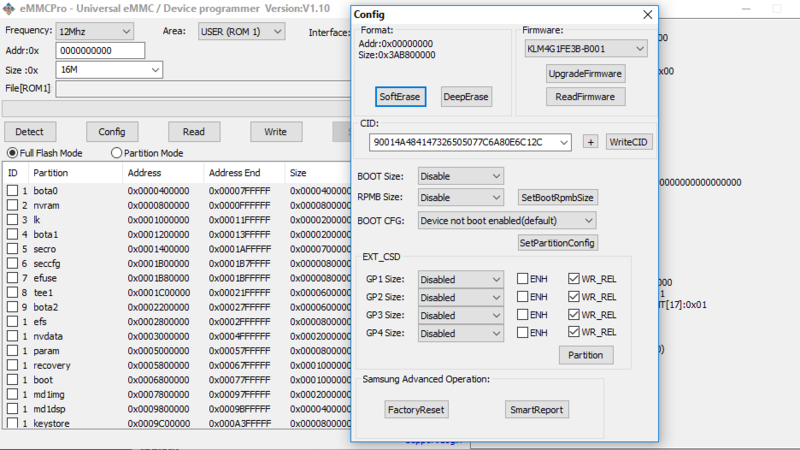 This will show you the health of the Samsung eMMCs included Capacity , NAND BANKS , BAD Blocks of each BANKS . Resizing and activating GP1,GP2,GP3,GP4 partitions is important in some mobile phones contain this partitions . # it is critical to repair ASUS Zenfone .